This year the 4th falls on a Tuesday so it's a particularly long weekend. That means lots of bbqs, parties and socializing with friends. I've been watching my calories lately, trying to lose the last of my baby weight and I've switched it up from my usual wine to tequila. The reason why is that tequila has fewer calories (64 per ounce), is naturally sweet (since it comes from agave) and has a lower glycemic impact and no hangover! This makes it one of the healthiest options for alcohol around. I usually drink mine with a few limes squeezed and a dash of sparkling water but for the holiday weekend I may splurge and throw in a splash of fresh squeezed grapefruit! Mix the grapefruit juice, tequila and agave syrup until well mixed. Pour over a tall glass filled with ice and top with soda water. Leave the sugar out, it won't be sweet but it's still delicious! What do I intend to be doing this weekend whilst sipping my tequila you ask? I grew up in Manhattan Beach and my parents still live there so summer weekends often include a little beach time. I like to keep things simple when beach bound. My favorite accessories I'll be rocking will definitely include some festive shades of blue! I first learned about Teixits Vicens from a friend of mine who has a vacation home in Mallorca, Spain. I've never been to Mallorca, (or Spain for that matter) but am dying to go. Teixits Vicens is a family owned and operated textile company that hails back all the way to 1854! 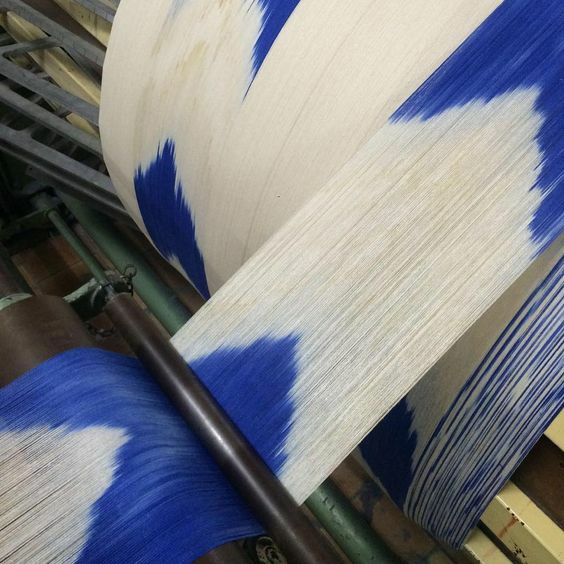 They use all natural fibers like cotton and linen and they make all their patterns in house. There are so many beautiful colors and designs to choose from it's hard to pick just one. 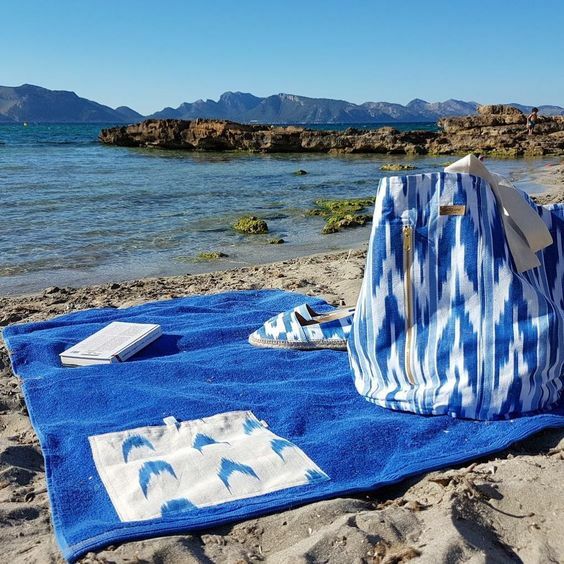 I ultimately chose the Petate beach bag in blue ikat. It's huge and fits everything (I"m a bit of a pack rat, I like to be prepared for anything) They also make home accessories, clothing, shoes and bags even chairs. In this day and age when it's increasingly difficult to find items that are not mass produced, it's so special to find something unique and hand made. Anyone who is familiar with my jewelry line, knows I LOVE lapis. I love it's rich vivid blue hue, reminiscent of an Yves Klein painting. I use lapis a lot in my pieces, both in my fashion and fine collection. One of my favorite fashion lapis styles are these elongated Sarotte drops. I purchased these lapis stones on one of my annual trips to the Tucson Gem Show and then electroformed 18k gold on them to make a minimal bezel. I really wanted the emphasis to be on the beauty of the lapis rather than a flashy setting, which is why I often opt for a minimalist clean setting when making my jewelry. I hope whatever you're doing this holiday weekend, you're having fun and staying safe! Cheers! 14th Factory Tour: 10 reasons you need to go now!